It’s our last Grahamstown festival for a while, so join us as we end our six year run in style. Tickets available here. When we arrived for our first National Arts Festival in Grahamstown back in 2012, we had no idea how much we were going to fall in love with the festival. Our show was Stand-Up Musicians (free album available here), and we had no clue whether anyone would actually come watch it. But after a couple of hours of flyering on the Village Green we started to discover our favourite thing about the Grahamstown Festival… it’s where people come to see and support art in South Africa. And that art includes men in suits singing songs about Steri Stumpies. In the last six years we’ve helped a person propose at the Sundowner Concert, we’ve used Rob van Vuuren and Martin Evans as human mic stands, we’ve sneaked our whole late night audience backstage, and we’ve even had a fan knit us an emergency Christmas hat. So come on down to The National Arts Festival, say hi to us on the Village Green, go see loads of shows, and maybe pop into ours. The Brothers Streep are back with their final run of their hit musical comedy. “Undeniably good guitar skills accompany clever and witty lyrics” in a show that’s “fun and enjoyable” (CUE, 2016). It’s the brothers’ last Grahamstown Festival for a while, so don’t miss out and come book a show! 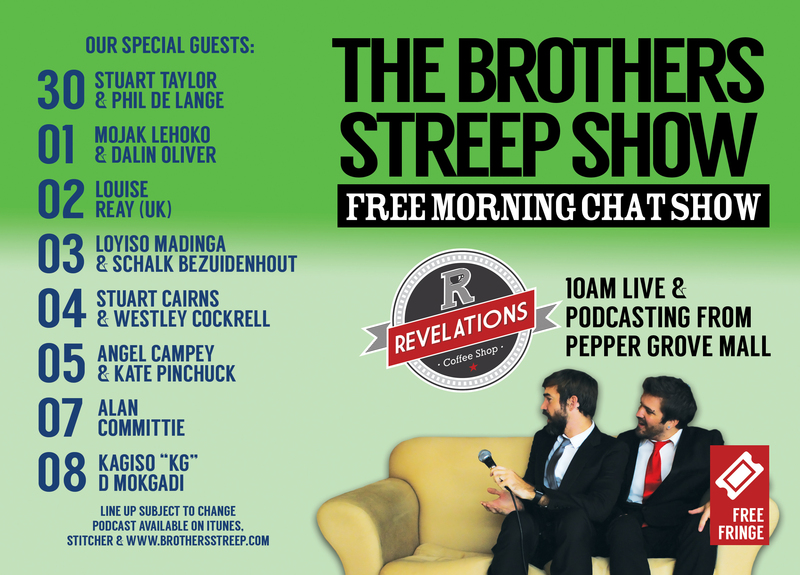 Join The Brothers Streep and special guests for a live (and free) morning chat show, most days of the festival, 10am at Revelations Coffee Shop. Guests include Stuart Taylor, Mojak Lehoko, Angel Campey and Alan Committie. Group discounts are available, so take advantage of them!